The photography remains of the highest quality, although I often wonder why they select certain photos. The book's title suggests the photos will showcase the best of the decade, but there are an awful lot of questionable photos if that is truly the mandate. Shane O'Brien drinking water? A Florida Panthers "Est. 1993" ball cap? Countless players going through routine slap shots or warm ups? As always, some of the photography is down right amazing. But outside of the iconic Stanley Cup presentation photos and the Winter Classic pictures, there seems to be an awful lot of the best of the last decade not represented in this book. Where are the famous goodbyes? The record breaking moments? Ovechkin's famous goal? And most obviously missing, where are the Olympics photos? I can think of an easy dozen choices from the 2002, 2006 and 2010 Winter Games that need to be included in any photo scrapbook of the decade's best in hockey. An undisclosed portion of the proceeds of the sale of this book goes the charity Hockey Fights Cancer, a most worthwhile cause. Through all the charitable endeavors to date, more than $11 million has been raised to support national and local cancer research institutions, Children's Hospitals, player charities and local cancer organizations. The book itself is an eye-catching coffee table book. It is a popular series and solid pick up for the hockey fan on your Christmas shopping list. But I can not help but think of what this book should have been rather than what it is. "A vivid visual record of a decade of great hockey. 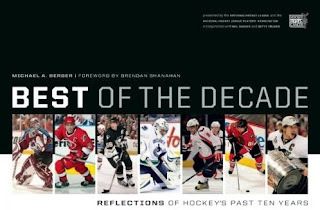 "Filled with stunning photos, Best of the Decade celebrates the highlights of the NHL’s first ten years of the new millennium. During these years, the NHL itself expanded—both locally and globally. The millennium began with the birth of two new teams: the Columbus Blue Jackets and the Minnesota Wild. Meanwhile, the league extended its influence abroad, hosting a series of hugely successful games in London, Prague, Stockholm, and Helsinki. In 2003 the Heritage Classic was born—the first outdoor game in NHL history—which continues to draw huge crowds in such storied locations as Chicago’s Wrigley Field and Boston’s Fenway Park. "Tripped up by a mid-decade lockout, the NHL had to cancel the 2004–05 season. But the league came bouncing back with a return to basics: exciting young players, explosive team rivalries, and exhilarating games—all those elements that keep hockey fans on the edge of their seats. "Take a fond look back at a decade of professional hockey—with all the action, drama, and excitement you’d expect from the Reflections series."